Easy Chicken Chili - I don't like chili. 'There, I said it. 'I'm talking about the tomato, beef, and kidney bean laden chilis, though. 'The kind you see in chili-cookoffs, certain fast-food establishments, etc. 'I apologize if there is anybody reading this who has ever made me chili. 'Let me clarify, though. 'Chili does not fall under the'hated-food-categories of things such as bell peppers (gasp! ), any kind of melon, bananas, etc. 'I will eat chili and be fine, but I never crave it nor think it is a good idea to make it myself. But then there is 'white chili', the kind usually made with turkey or chicken, and white beans. 'Friends, this is a totally different thing! 'So it was with pleasure that I was able to make this meal with items I already had in my cupboards and refrigerator. 'No going to the grocery store needed. Please excuse the lack of photos for this recipe, as it was kind of last minute, and I was hungry. Heat the oil over medium-high heat in a 5- to 6-quart Dutch oven. 'Add the onions and cook, stirring, until tender, 4 to 5 minutes. 'Add the cumin, oregano, and garlic and cook until fragrant, about another 1 minute. 'Stir in the chicken and chiles and then add the broth and 1 can of the beans. 'Bring to a simmer. 'Reduce the heat to low and simmer, partially covered and stirring occasionally, until the flavors blend, about 20 minutes. 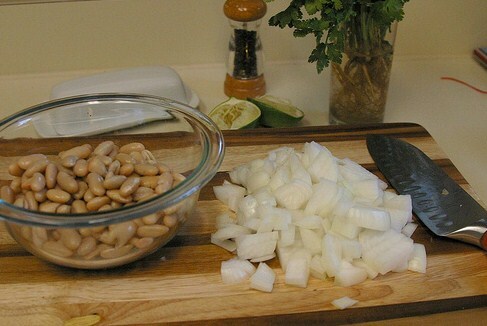 Meanwhile, pur'e the remaining can of beans in a food processor or blender. 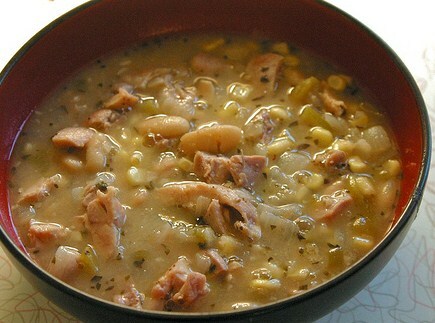 Stir the pur'ed beans into the chicken mixture, along with the corn. 'Continue to simmer to blend the flavors, about another 5 minutes. 'Ladle into bowls and serve. 'Garnish with chopped cilantro (if you like cilantro, that is).